Metallurgy is a domain of materials science and engineering that encompasses both the processes involved in procuring metal from ores, typically termed extractive metallurgy, and the processes involved in working and shaping metals to produce usable materials and products, termed process metallurgy. Metallurgy can also be separated into ferrous metallurgy, which concerns the production and use of iron-based alloys such as steel, and non-ferrous metallurgy, which concerns all metal-based materials that do not incorporate iron. 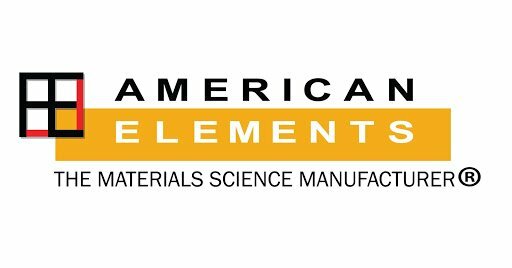 American Elements manufactures a comprehensive array of materials for the metallurgical industry. Our products include both bulk metals and alloys, materials for use in powder metallurgy applications, and formed materials such as wire. We supply pure forms and master alloys of all common metals such as copper and iron, as well as rare earth metals, precious metals, and other specialty materials. Additonally, we sell products used in metal refining and manufacturing, including bricks and crucibles composed of refractory materials, as well as a wide variety of chemicals used in metals processing. All materials can be custom made to customer specifications for shape, size, purity, composition in all amounts including bulk quantities. You may also request a quote directly for a material. American Elements has the capability of executing sophisticated materials analysis as required by our customers. For the analysis of metal and alloy products specifically, metallography and crystallography-based analyses can be made available upon request. Extractive metallurgy processes are used in separating pure metals from undesirable materials. The focus of extractive metallurgy has always included the development of more economical and efficient processes for extraction, but in recent years additional efforts have gone towards development of processes that are more environmentally friendly: using fewer toxic or dangerous chemicals and producing less pollution. 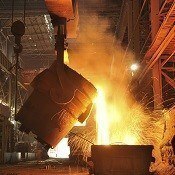 Refining metallurgy involves the final purification of impure metals. This is contrast to upstream processes that extract metals from ore and require additional purification or refining to produce a highly pure finished material. Forging involves applying a press or die to metal for shaping and increasing its strength. Drop forging relies on dropping a die onto the metal whereas forging presses use anywhere from a few hundred tons of pressure up to 50,000 tons of pressure to forge metal products. Extrusion is a process used to produce long, straight metal parts. Frequent shapes produced by extrusion include cylinders, gear blanks, tubes, cans, structural components, frame members, and railings. Hot extrusion is conducted at between 50-75% of the melting point for a given metal. Cold extrusion is conducted at ambient or near ambient temperature and can be used on a variety of robust materials such as steel, copper, and aluminum alloys. Metal injection molding is used for mass production of parts having complex geometries. The technique involves using powdered metal in combination with a binder material. The resulting mixture is used as a feedstock in injection molding processing equipment. Metal cutting processes such as abrasive cutting and precision cutting require designated tools and techniques depending on the desired cut and metal(s) involved. Machining tools are specially fabricated for metal cutting, drilling, milling, tapping and other processes. Powder metallurgy involves the production of metal forms from blends of fine metal powders. Powders of varying grain sizes may be used to produce desired characteristics such as microstructure and porosity for a given application. Metal components are produced by pressing the powder mixtures desired form and heated in a controlled atmosphere to bond the material in a process known as sintering. Sintering relies on diffusion to gradually bond the fine grains of metal together rather than complete melting. These techniques allow for the production of a wider array of possible compositions than is possible from direct alloying of bulk metals, as concerns regarding phase transition points can be largely disregarded. Through this process, finely structured components can be produced from metals or alloys that are impractical to melt or machine. The major downside of powder metallurgy comes from the dangers of using metal powders, many of which are highly reactive with atmospheric oxygen. Powder metallurgy materials must therefore be handled with care, and production carried out under controlled conditions. Common products produced using powder metallurgy techniques include automotive parts and watch components. Brazing is a method using a filler alloy to join two or more metals at a contact region. Higher temperatures are used in brazing as compared to soldering. Manufacturing processes such as those for circuitry components incorporate a material commonly referred to as solder to fuse metals at relatively low temperatures. Solder refers to a range of low melting point metal alloys which traditionally contained substantial quantities of lead. Increased awareness of the dangers of even low-level lead poisoning, in addition to concerns regarding leaching of lead from soldered parts of electronic devices in landfills, has increasingly led to the adoption of newer lead-free solder formulations. 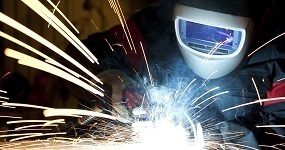 Welding is a process used to join two metal components to form a continuous material. While additional material may be added as filler in some welding processes, welding involves actually melting the components to be joined, making it distinct from lower-temperature joining processes in which only a lower melting point filler alloy is melted. Arc welding processes utilize a welding power supply to create an electric arc between an electrode and a material used to melt metals at the welding area. Common welding power supplies are constant current power supplies and constant voltage power supplies. The length of the arc is directly proportional to the voltage and the available heat is proportional to the current. Oxyfuel welding is a traditional welding processes that utilizes oxygen and fuel gases to weld and cut metals. The use of pure oxygen rather than air is used to increase the flame temperature to allow welding or cutting of working materials such as steel. This process is commonly used to repair metal parts and to weld pipes. Resistance welding is a process involving heat generation by passing current at the contact point between metal surfaces. The resistance at the contact point is responsible for the heat production and results in molten metal at the contact region. Annealing is a heat treatment process used to reduce thickness or refine the material surface and internal structure. Annealing involves heating a material to increase its ductility. Tempering materials involves heating the material below the critical temperature for a period of time in order to increase the hardness and toughness of the material. Tempered steel is a common example of heat treated metal alloy. Quenching cools metal(s) at a rapid rate and, depending on the material’s composition, imparts properties such as strength, hardness, altered microstructure internally or at the surface of the material. Precipitation strengthening is also known as age hardening where solute atoms are precipitated at ambient or other temperatures in order to produce surface coatings with increased hardness. Electroplating or electrodeposition is the process of applying a thin layer or plate of metal onto an electrically conductive surface. Electroplating is often a finishing process for a given product. For example, depositing a corrosion resistant metal alloy, such as zinc based alloys, onto a metallic surface can give the finished product corrosion resistance properties.